Cleveland, OH, March 20, 2019 --(PR.com)-- Keene Family of Companies is proud to announce and welcome three new team members in the departments of Manufacturing, Engineering and Information Technology. Doug Meredith joins Keene Building Products as the Director of Manufacturing. As a graduate engineer from Mississippi State University, Meredith will bring extensive experience in industrial processing, optical sorting, and bulk handling. Meredith also possesses a solid background in all areas of plant and facilities engineering, while maintaining a hands on approach as a manager. Meredith is a decisive leader with experience in developing talent, and creating effective trainings programs. Jason Benzing joins Keene Building Products as a Senior Engineer. Benzing graduated from the University of Rhode Island with a Bachelor of Science in Chemical Engineering. Benzing comes to Keene as a dedicated engineer and manager, with over 10 years of experience in fast paced manufacturing settings. With skills in statistical analysis and data management, Benzing will contribute to the improvement of processes and quality at the Keene Plant. Ryan Hephner started at Keene as an IT Consultant leading the implementation of the company’s ERP system. Keene is excited to have Hephner now on board as a full time employee, who handles all technical concerns and facilitates service improvements. Hephner, an Honors Graduate of the University of Dayton, joins team Keene with an impressive background and education in Information Systems. Hephner’s ability to identify and solve problems makes him an excellent leader in technologies at Keene Family of Companies. 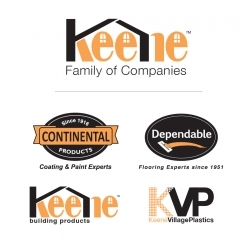 Keene Building Products is an American manufacturer of 3-dimensional products for the building envelope, noise control, and roofing markets. For further information call 877.514.5336, email at info@keenebuilding.com, or visit website keenebuilding.com.